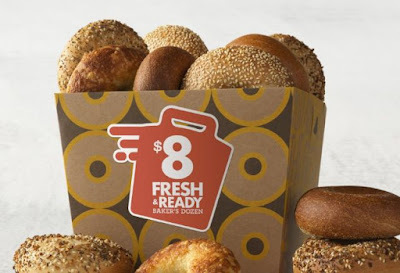 For a limited time, Einstein Bros. offers the new $8 Fast & Ready Baker's Dozen, a pre-packed 13-count selection of the chain's most popular fresh-baked bagels. The $8 Fast & Ready Baken's Dozen includes three Plain Bagels, two Cinnamon Raisin Bagels, two Whole Wheat Bagels, two Blueberry Bagels, two Sesame Seed Bagels, and two Asiago Cheese Bagels. The price represents a $3 savings over a regular baker's dozen of bagels. You can also add two tubs of Shmear for an extra $4. The $8 special is only available Monday through Friday until 11 AM at participating locations. You can't customize it as it's already packed and ready to go.